Before I get to my favorite gluten-free products, let me start by saying, I’m not fond of food “products.” I’m a nutritionist specializing in healthy, active, gluten-free living. That means a focus on whole foods and an active lifestyle, not gluten-free Dunkin’ Donuts, processed food, and unlimited couch time. I advise people to stick with the real thing (vegetables, fruit, nuts, seeds, a few naturally gluten-free grains, small amounts of high-quality meat). That’s straight forward and simple enough. Hey wait—back up. No, it’s not simple. It’s hard and frustrating at times! What if you want an oatmeal cookie, a pumpkin muffin, some pancakes, a grilled cheese sandwich, or a pizza? These are the most common questions/comments I get from people who are newly diagnosed with gluten-related issues. Help! Tell me what I can eat. Tell me what bread to buy. How can I possibly survive without wheat? All the gluten-free products taste like ground styrofoam. I know. I get it. I like pancakes, cookies, and grilled cheese sandwiches, too. And there’s nothing better than a pizza piled high with fresh vegetables. Here’s the deal, though—those should be occasional treats, not daily indulgences. We thrive on real food, not meals from boxes with futuristic expiration dates. But don’t despair, there are ways to navigate the super market and make wise choices when it comes to gluten-free packaged food. We have to live in the real world, right? Every once in awhile we’re going to want something we didn’t grow from scratch, hunt down, or buy at the farmer’s market. Here are my top 5 favorite gluten-free products. These are 100% whole grain oats and although they’re processed to some degree, the processing is minimal and done with great care (dry milled, no heat applied). These aren’t your typical oats. They’ve been carefully selected (by nerdy plant scientists) for their high protein content and favorable amino acid profile. They’re also very low in avenin, the peptide thought to be responsible for allergic reactions. Yes, I know—as part of a gluten-free diet, oats are somewhat controversial, but recent research indicates that pure, uncontaminated oats are safe for most people with celiac disease and gluten-related issues. This study found no immune response to avenin in people with celiac disease, but check with your health care provider if you have concerns. It’s often the high fiber content that bothers people and not the protein. Aside from hearty oatmeal, these oats make the best cookies. If you don’t want to do the baking yourself, check out Gluten-Free Prairie. They use these oats for their “Granola Bites” and “Hunger Buster Oatmeal Cookies.” They’re delicious. I love pesto, but it needs to be tossed into a bowl of pasta for optimal enjoyment. I make pesto out of a variety of different greens, from spinach to mustard micro-greens to baby kale (check out this recipe on my other website, Artful-Aging.com). Tinkyada pasta is the best gluten-free version I’ve found. It’s organic, easy to work with, and never mushy. They also have a great selection of pasta types (spaghetti, elbow, penne, etc.). I no longer blend my own gluten-free baking mixes because Pamela’s general baking mix is as good as it gets. This gluten-free mix rivals the best out there, whether gluten-free or not. I’ve use it for pancakes, waffles, muffins, quick-breads, and cookies and haven’t had any trouble substituting it for wheat flour. If you have a nut allergy, this mix is not for you as it contains almond meal. Canyon Bakehouse is a dedicated gluten-free bakery located in Loveland, Colorado. This 7-grain bread is my favorite, all-purpose, ready-made bread. It’s packed with healthy, whole grains like teff, quinoa, and amaranth and has a wheat-like texture. It’s even good without toasting it (the litmus test for good gluten-free bread). Outside The Breadbox is a dedicated gluten-free bakery located in the historic district of Colorado Springs. These 12-inch pizza crusts are easy to prepare and make a delicious, thin crust. They’re hard to come by, especially if you don’t live in Colorado, but you can order them directly from the bakery. Do you have any favorites that should be on this list? Peace, love, and occasional treats! This entry was posted on Monday, October 14th, 2013 at 12:42 pm	and is filed under Celiac & Gluten Intolerance, Gluten-Free Recipes. You can follow any responses to this entry through the RSS 2.0 feed. You can leave a response, or trackback from your own site. I agree with you about missing great bread. Sometimes there’s nothing better than fresh, hot-from-the-oven bread dripping with butter. I’ve never heard to Against the Grain. The only really good baguette I’ve had in over a decade is one that Carol Fenster (queen of GF baking) made from scratch. I drove right by the Capital Hill Whole Foods yesterday. Darn, wish I had known about these baguettes! I’ll give them a try next time I’m in the neighborhood. Hey, our pediatric gastroenterologist gave us a great bread recipe that is super easy and super yummy, especially right out of the oven!! Bake at 350 for 40-45 min. Thanks for adding this! It looks like a very easy all-around recipe. Teff adds a good nutrition boost and sorghum is a great basic flour. Nice! I really appreciate you going to the trouble of adding this to the “mix,” so to speak. Thank you for never giving up on me! I’m not exactly a prolific blogger these days. =) I agree, sometimes fast and easy options are a must for a busy mom. And pancakes on Christmas morning are a tradition in our house. Your kids sound awesome and are cute beyond words. But, yes, sometimes a piece of toast from bread you didn’t have to make from scratch is important. As for legumes — YES, I’m a huge fan, but just didn’t go into detail in that parenthetical insert. I also eat eggs and goat yogurt. I don’t follow any particular “diet” or eliminate whole groups of food (other than gluten-containing). Legumes are a mainstay in our house. Nutritious and inexpensive. Isn’t the “toast-test” the universal determinant of good GF bread?! =) I’ll have to sift through your blog for your pizza crust recipe, although pizza at our house is one of those “don’t want to cook” options. You know how it goes. There are nights when all I can do is cut up a bunch of veggies and put them on a pizza crust. Making the crust from scratch isn’t in the plans. You know, I probably should have added the Attune Foods “Buckwheat and Hemp” cereal. Hmmm? I might have to edit this post. Would LOVE to see you here one of these days! My family loves the occasional treat of “Against the Grain Pesto Pizza and Three Cheese or Pepperoni!” The Pesto is the best GF pizza in a box or even much better than any we have had at restaurants! Only homemade can compare ; ). Have you tried Bionature pasta? Delicious. I do love Tinkyada but Bionature is my favorite. Be still my heart—a new post from Melissa! yaaay!! So happy to “see you” in my email inbox. I agree with your sentiments re: homemade is best and whole foods are optimal. But sometimes, it is really helpful to have some good “go-to” products we can trust. I can honestly say I agree with your first 4 suggestions, but I am not familiar with #5. I have never seen it before, but I will look for it. My cousin’s wife graciously sent me a box of King Arthur GF Brownie mix and the cookie mix, citing she did not know if I ate brownies and cookies, but when she saw they had GF mixes, she thought of me. How sweet is that? So, to add to my post-DX weight gain (lol)I tried them this past summer and I have to say: they are very good. But no, I do not need them hanging around my pantry. Namaste makes a spice cake mix that a fellow celiac recommended to me last year and when you add some shredded carrots and pineapple and walnuts (or use zucchini instead) and top with a homemade cream cheese frosting, you’ve got a pretty terrific carrot cake. Again, this is loaded with calories –and really YUMSTERS!– so save for special occasions. So good to get back into the swing of things and see your smiling “heart” in my comment section! Great comment and I totally agree with you on not needing certain treats hanging around the pantry! Good point. You are a wealth of good information. I’ll definitely try some of your suggestions. I guess I better find the “Against the Grain” products. It seems everyone loves them. You make tiramisu? Wow, I’m impressed. I don’t think I’ve had that for 15 years. I think I may have tried the Namaste brand before, but I’m not sure which version. Spice cake is a favorite of mine, so I’ll give that one a whirl. Thanks! Hope all is well with you. You’re back!! I’m adding my 2 cents worth to the comments about Against the Grain baguettes and pizzas. I’ve never recommended 1 brand so much to so many. And a bag of Pamela’s baking mix is worth it’s weight in gold. But I’m with you, whole foods is the way to go when you’ve got the time, although as a full-time worker, I appreciate the availability of quality products like the ones you and your readers have mentioned. I think of you often and need to get my act together and figure out a date for lunch. I’d love to see you. Well, it seems everyone love Against the Grain, so I’ll make an effort to pick some up. It’s odd that I’ve never tried it. Pamela’s is definitely my “go-to” mix. I also appreciate the availability of good products. Every so often it’s important to be able to whip something up in a matter of minutes, rather than starting from scratch. Let’s connect soon. We’re eventually moving to Salida. I”m with you on all accounts all though I’ve not tried the pizza crusts. My hubby lives on those oats. We love them. Just about to make some cookies using them. I’ll have to see if I can get those pizzas. Glad you like the oats. I honestly think they’re a great addition to the GF diet if you can tolerate oats. 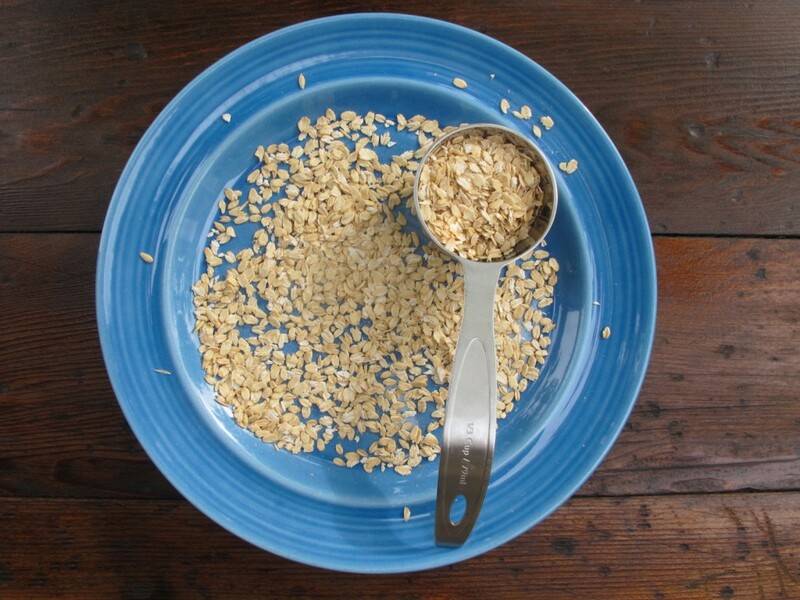 These particular oats are the “cream of the crop.” I use them in so many ways. And their groats (Rocky Mountain Rice) are delicious, as well. I’ll add my vote to the Against the Grain products. They are pretty phenomenal IMO! And the folks that own/operate them are good VT stock. I’ve met them at events before. They started the company because of their own personal gluten-free story which, of course, I love. They have perfected a dairy-free pizza, but don’t have the space, etc. to produce it and add it to their product line yet. I’ll look forward to that day! In the mean time, I only occasionally buy their products, but love it when I indulge in them. I love those Montana growers and their standards and products after meeting them through you, Melissa. I don’t eat oats often either, but I really need ones I can trust when I do. I’ve had the Canyon Bakehouse hamburger buns (pretty good! ), but not the bread. It sounds great! And I haven’t heard of those pizza crusts either. Will check those out as well. I love that you got some great CO products in this listing. I agree with the endorsement of Bionaturae pasta. It’s wonderful, but it contains soy flour, which I don’t do well with, so Tinkyada it is for me, too. We don’t have crackers on hand very often, but I occasionally like some of the Crunchmaster crackers. Kitchen Table Bakers (based in NYC) has some phenomenal cheese-based crackers. Worth a splurge and amazing with a glass of wine! That getting sick factor is the stumbling block fo me with so many products, so on a day-to-day basis, it’s not only real food that’s naturally gluten free for health, ease, lack of expense, but just to stay safe. Being able to rely on a few products is really nice though. Thanks so much for this post! Thank you so much for all this great information! I think it’s important to provide people with a few “ready made” options, although as we know, whole foods are the best choice. I work with folks who don’t like to cook, are totally freaked out by a celiac or gluten sensitivity diagnosis, and if you can get them to at least pile some healthy veggies on a ready-made GF pizza crust, that’s a good start. Some of these GF processed foods are absolutely horrible, no more nutritious than ground styrofoam. It’s nice to have a list of fairly healthy product suggestions for people. And for ME. I don’t always want to whip up something from scratch and as you know, I like my occasional pizza! I will definitely keep my eyes peeled for the “Against the Grain” products! That’s been a common thread throughout this blog post! These all sound amazing! Thanks for sharing, love!!! I use Canyon Bakehouse bread and love it!